In our last post, we looked at the strength of three of the most common materials used in constructing outdoor cabinets–High Density Polyethyene (HDPE), Polyvinyl Chloride (PVC), and a foam resin. HDPE easily proved to be a stronger, more robust material. Now we’ll look at the durability of each material. You’ll spend a big chunk of change on your outdoor kitchen. You’ll want to make sure it lasts, and stays looking new for years. If you have a concrete, composite or even a wood deck, most people would probably think a pressure washer is the quickest, most efficient way to clean their deck. If you have an outdoor kitchen sitting on top of said deck, after sitting outside day-and-night for months on end, those cabinets can get pretty cruddy. Your first inclination might be to just turn the pressure washer loose on your cabinets, as well. 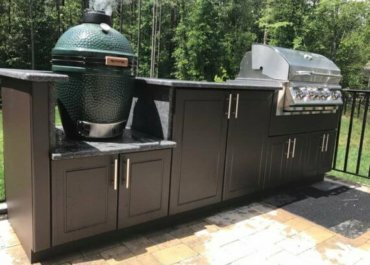 If you have a Werever outdoor kitchen, which is made from HDPE, you’re right on! That’s exactly how we recommend you clean them. Hit it with the pressure washer and get back to enjoying your outdoor kitchen. But what if you have another brand? What if that other brand is made out of PVC or a wood-looking material that is actually a painted foam resin? Can you use a pressure washer on them? If you read the fine print in their warranties, they’ll tell you specifically that they will not warranty an item that’s been sprayed with a pressure washer and was damaged. Okay, you think, you’ll find another method to clean them. But what if you’re using your pressure washer on your deck and you slip and nick your cabinets? And what if you hire someone to pressure wash your deck? Will they take the same care that you do in avoiding damaging your fragile cabinets? We’ll show you how each material can handle direct hits from a pressure washer. What about heat? Heat can wreak havoc on all kinds of materials. Since your cabinets are sitting outside day-in and day-out, can they handle the heat? You want to spend your time enjoying your outdoor kitchen, not worrying about damaging it. Now that we’ve compared the strength and durability of HDPE cabinetry, check out our next post where we discuss ease of care.